The Parish Clock in St. Mary's Church Tower. It was originally purchased and installed into the Tower of the original Church in 1822 by means of a £200 loan generously made available to the Parish by James Randall. It was later reinstalled into St Mary’s ‘New Tower’ in 1857. The clock had been hand wound weekly by countless unrecorded names from then until 1964. Public Subscription and the generosity of the Villagers and Local Residents, £650 was raised to completely overhaul the clock in 1964 and a new automatic winding system was installed and both faces of the Clock were fitted with copper dials painted blue. The following names have been recorded as being involved in the maintenance of the clock between 1822 and 1964. 1845 William Hanson. 1855 A Boulter. 1920 C.S. & L.S. Hill 1945 P.Neave. 1958 Dysons of Windsor 1964 Dysons of Windsor. The responsibility for maintenance and repairs was taken over by The Parish Council on 20th April 1964. The Clock has since been maintained by Mr Len Craft of “Public Clocks Ltd” of Iver and is serviced annually. The responsibility for regulating the Clock and monitoring its ongoing performance for over 25 years had rested with the late John Mallin. Antony Edwards took over responsibility in July 2005 when John was no longer able to manage climbing the ladder into the Clock Chamber. When Antony moved on retirement in 2017, this essential service was taken over by Peter Harris who has upheld the tradition and continues to wind and generally nurture the clock through all seasons. In 2007 the Clock was getting more and more difficult to regulate. Cogs and bearings were wearing out and a serious overhaul was clearly needed if this Village amenity was to survive and be enjoyed by future generations. After lengthy discussions with the Parish Council and the necessary money allocated, it was finally agreed that we could go ahead with the repairs. So in July 2009 the work began and the Clock’s hands were taken down for a few weeks whilst new drive shafts were being made. The hands were then replaced and set at 12 O’clock whist the painstaking job of dismantling the main Clock mechanism itself took place and the transporting of the pieces in buckets down the narrow spiral staircase of the Tower. Everything was put back together and reinstalled in mid October 2009. Public Clocks have done us proud. Their expert and dedicated Team did an excellent job in restoring the Clock to its former glory, for all of us in Datchet to enjoy for many more years to come. 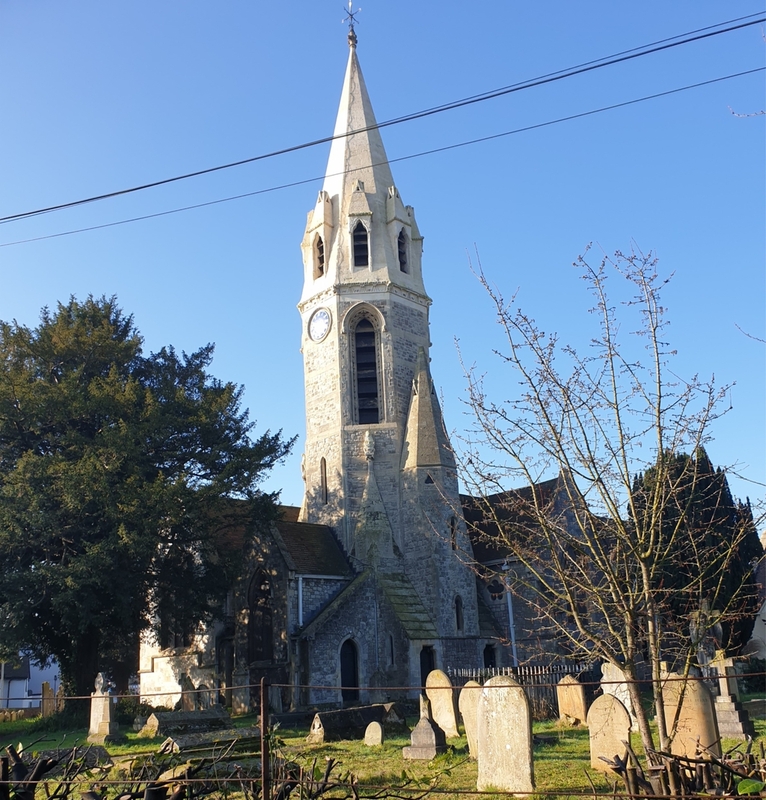 Then in late 2016 whilst the Church Tower was under scaffolding for major refurbishment, the Church and the Parish Council took the opportunity to have the two rather tired looking Clock faces removed and renovated by Public Clocks at a cost of £2,200. They are now back in place with their blue faces and re gilded hands in place and looking absolutely beautiful as the sun moves around the Tower each day !